I am of the belief that every child should be taught how to swim at an early age, the earlier the better. Actually, infants are quite comfortable in the water and if not nurtured and practiced, we somehow loose this comfortableness in the water when we get older. Even though later in their lives, the kids who were taught to swim at an early age, might not continue with swimming as a sport, some basic swimming survival techniques will be retained which one day just might save their life. If you weren't one of the lucky ones whose parents taught you how to swim or enrolled you into a swimming lesson program when you were younger, you are in a disadvantage, however, you can still learn to swim, so it is by far not a lost cause. There is never too late to start, so feel free to dig into our Novice swim lessons and go out there and get into your closest body of water and get wet. The most common question, I get from folks that are just starting to get used to water and the feel of your body in the water, is "what should I do when I feel like I am drowning?". The first thing, everyone says to that is "don't panic". Well, this is easy said, but much more difficult to do when you are already in a state of tension when you are in the water. However, by practicing a few simple swimming techniques over and over, you will become more comfortable in the water, therefore more relaxed and furthermore a bit more confident that panic will not set in if you happen to find yourself in a situation in which you feel like you have no more energy to stay afloat. First thing to remember is that, a human body is naturally buoyant if the lungs are filled with air. What I mean by that is that if you take a deep breath of air, you will not sink :). Simple right? Yes, it is, until you have to take another breath which causes you to exhale the air that kept you buoyant and this moment of short sinking time could cause the panic and drowning if it ends in the worst case scenario. So, first thing to remember is that you will float if you keep breathing in air, so in a way, there is no reason to panic since we all breath many many times a day on a regular basis. Second, the best way to take an air in the water is when you are on your back. If you are on your front, face in the water, it is much more difficult to raise your head and take the needed breath. Of course, it is possible. If you are on your front, make sure to take a breath to the side and not to the front. However, this is a skill you will learn later in your learn to swim endeavors. So, if you feel like you are out of breath and you start to panic that you will drown, just flip your body on your back, in the very same way you are when you sleep. Just lay your head back on the pillow (water) and relax. It is very important, when you are on your back that you keep your head tilted a bit backwards, so your eyes are looking at the ceiling of the pool or the sky if you are outside. This head position will cause your legs to float to the surface or at least rise a little, so you are not vertically in the water. Then you are free to take as many breaths as you can, because your mouth is out of the water and it does not need to go back in. If you have troubles with sinking legs, you might want to try shinfin™ leg fins which do wonders with the sinking leg problem. because the difference of the air in and out is very large and it will take you longer to exhale and inhale again. The best practice is to inhale just enough breath to keep yourself afloat, hold for a few seconds and then exhale again. There is no reason to keep holding the breath for a long time as it causes CO2 build up, thus making you feel like you are out of breath more. If you keep breathing normally as you do during your regular day as a dry land walker, you will be just fine. If you are already swimming around with easy and you do a lot of open water swimming, do not dismiss the above guideline on how to prevent yourself from drowning. You never know what can happen. It happens even to the best of us as we saw in the FINA Open Water 10-kilometer World Cup in Fujairah, south of Dubai with the tragic death of an elite swimmer Fran Crippen. 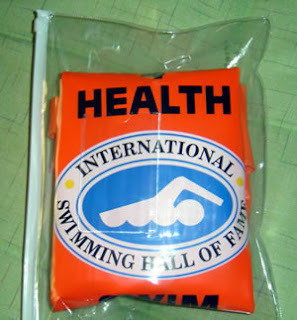 To make swimming a safer sport, the International Swimming Hall of Fame in Ft. Lauderdale, have came up with a specific swimming safety floating device Swim Safety Device, which you can attach to yourself while swimming. When you get tired, you can use the Swim Safety Device as a resting buoy. In addition to the swimming safety device being a floating device, it also is a dry bag to store your valuables and to top it off, it is designed not to slow you down when swimming, it just floats nicely in your wake behind you. That said, if you are just starting out with swimming, don't be alarmed and afraid. Swimming is a wonderful sport, but as it is with everything in life, the correct precautions should be taken before attempting something you are not familiar with. 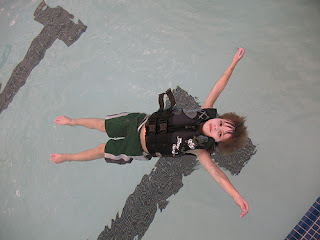 Be it swimming lessons, floating device, good health etc. Since you are reading this blog and you got this far, you are already on your way to an enjoyable swimming experience:). I came to this article when I had almost drowned in the water that was NOT too deep, it was just few inches more than my height. My legs suddenly sank, and I was standing on the ground. I was confused what to do, fortunately I was near the wall, someone helped me to get the hold of it. Any tips on what to do in such situations ? I always get out of breath after every 10-15 meter (may be due to my inefficient stroke technique, I guess knee kicking), your suggestion of turning and floating on back would hopefully helpme. Thanks a ton for that! The most important thing in terms of learning to swim is not to panic. The second most important thing which goes along with the first is to realize that the slower you do things, the better you are off. When you start thrashing in the water, that is when it can end up badly. For example: when your face gets submerged and you know you can stand up, there is no need to jump up for air. All you need is your mouth out of the water, not your body from head to waist. Regarding being out of breath, this is related to the second thing I mentioned above. Slow is the key. 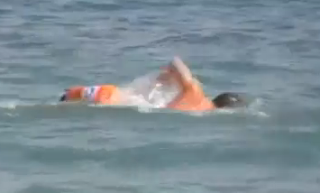 But in order to swim slow you need to be able to utilize the water's buoyancy property to your advantage. Don't fight it, but let it carry you. Therefore, learning how to balance your body would be the best place to start. Just started learning swimming..finished my 10 lessons..but still at times find hard to lift my head..